Bernard Reginald John Jeans was born in Yeovil in late 1898 or early 1899, the son of carpenter and joiner, later cowman on a farm, Herbert John Jeans (1878-1934) and Martha née Rashley (b1878). 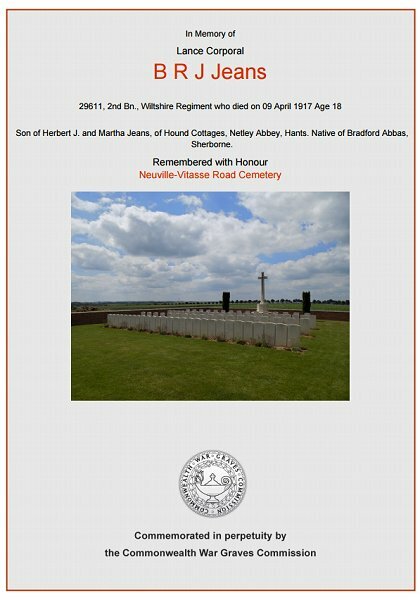 Herbert and Martha had a daughter, Valerie, born in Yeovil at the end of 1900 but the family were not to stay in Yeovil very long since by the time of the 1901 census they had moved to Bradford Abbas, Dorset and were living with Herbert's parents. During the next decade the family moved around a lot; a son Redvers was born in West Camel in 1907, Dennis was born in Berwick St Leonard, Wiltshire, in 1909 and Doris was born in 1910 at Stourton, Wiltshire, where the family were listed in the 1911 census. Bernard enlisted at Blandford, probably in early 1917 when he turned 18. Initially he enlisted in the Dorsetshire Regiment with the Service Number 3/7515 but was soon transferred to the 2nd Battalion, Wiltshire Regiment (Duke of Edinburgh's) with the Service Number 29611. He most likely had some previous military experience, perhaps as a cadet, since by April he had gained the rank of Lance Corporal. The 2nd Battalion, Wiltshire Regiment spent the first three months of 1917 around Arras. On 9 April 1917 they took part in the attack on the Hindenburg Line. Very few men reached the objective and those that did found that the German wire was undamaged. On 11 April the battalion came out of the line weaker by 16 officers and 363 other ranks, including Bernard Jeans who was killed in action on 9 April 1917. He was 18 years old. 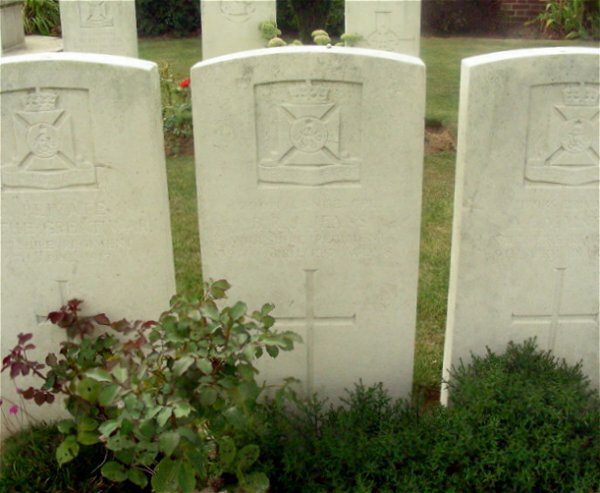 Bernard was buried in in Neuville-Vitasse Road Cemetery, Pas de Calais, France, Grave C23. His name was added to the War Memorial in the Borough in 2018. The Commonwealth War Graves Commission certificate in memory of Bernard Jeans. Bernard Jeans' grave in Neuville-Vitasse Road Cemetery, Pas de Calais, France.